2019 is the year when Sony and Microsoft are expected to announce their next generation consoles. However, that doesn’t mean that the current generation is over. Games that have been in development for the Xbox One and PS4 for the past few years will finally see a release date in 2019. If you are one rocking a PS4 or an Xbox One, then here is a list of 20 games to look forward to in 2019. Some of these games have a concrete release date where as others are expected to launch before the end of 2019. Just so you know, this list is in a random order. The first Rage may not have been a critical success, but it laid the foundation for over-the-top action in a first-person shooter. Rage 2 is all set to hit the home console in 2019 and will bring with it chaotic first-person action combined with some interesting powerups and a vast map for you to explore. Set after the end of Far Cry 5, Far Cry New Dawn takes the series in the post-apocalyptic world for the first time. A teaser trailer for the game was shown off at the Game Awards and it looks like the game is building a lush and beautiful post-apocalyptic world. If a cute and cuddly action adventure game with some humour thrown into the mix is what you are looking for, then you can check out Psychonauts 2. The game has been in development for about three years and will hit store shelves in 2019. From the creators of the action game Abzu comes a new adventure. This time, instead of using martial arts, you will use a bow and a quiver full of arrows to take down your foes. From the information that has been revealed so far, the game looks quite beautiful. Remaking classic games has been a trend of 2018 and it looks like the trend will continue for 2019 as well. Resident Evil 2 considered as one of the best games in the franchise is slated to hit the current console generation in 2019. The game will not only bring with it updated visuals but will also be reworked to function like a AAA game. A PS4 exclusive, Days Gone is set in a zombie infested post-apocalyptic world where you need to survive and take care of your one and only loyal companion – your motorcycle. The game isn’t linear like the Last of Us nor is it an RPG like State of Decay 2. The game is a third person action adventure game with lots of zombie killing and upgrades thrown into the mix. 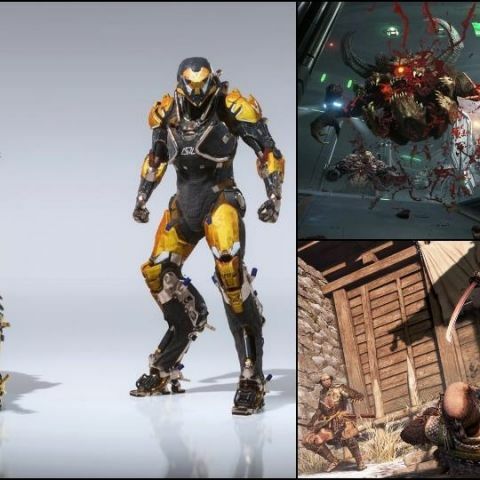 Anthem is a new game from BioWare the masterminds behind the Mass Effect franchise (as gamers, we don’t count Mass Effect Andromeda to be a part of this). We have seen a lot of interesting gameplay videos of the game and put simply, this is what an Iron Man game should have been. The game looks to blend the best of single player and multiplayer in one. An Xbox One exclusive that fans have been waiting to see for a long time will launch in 2019. The action adventure destruction game features the voice of Terry Crews. The game is expected to bring with it over the top action and some crazy weapons. Metro 2033 and Metro: Last Light were fantastic first-person shooter games set in a post-apocalyptic Russia. The game brought with it interesting dynamics like using bullets to kill or use them as a currency. Needless to say that the story of the game was quite engaging. We cant wait to see what the developers of the game do with the third instalment in the franchise especially since this game has been built from the ground up for the current console generation. One of the best action adventure games to hit the consoles, Devil May Cry 5 takes the series back to the roots that made it so popular. The game will bring with it familiar as well as new characters and a co-op mode in the game. If you are one that wants a taste of the game, you can download the demo on your Xbox One console. If you are one that enjoys challenging action adventure games like Dark Souls or Bloodborne or Nioh, then you should definitely check out Sekiro: Shadows Die Twice. The game is set in 1500s Sengoku Japan where you will take on foes that are not only larger than you but also bring with them mystical abilities. Ori and the Blind Forest was a fantastic Metroidvania style action adventure game with beautiful visuals, challenging gameplay and an emotional story. From what we’ve seen of Ori and the Will of the Wisps, the game is set to take things to the next level and bring with it a new story, new abilities and a new world to explore. A sequel to 2016’s Doom is titled Doom Eternal. This time, the demons from hell are on earth and it is time for the slayer to get into action. Equipped with an arsenal of guns, a new blade and flame thrower along with the ability to grapple onto your enemies the sequel to Doom looks quite enticing. Very little is known about Hide Kojima’s upcoming game and the more information we get about the game, the more questions we have about it. Nonetheless, if information circulating the internet is to be believed, then we will see the launch of the game in the first half of 2019. During the game awards 2018, head of Xbox Phil Spencer hinted that the new Gears game would launch in 2019. Whether this is confirmation or not is something time will tell. However, we cant wait to get our hands on one of Microsoft’s best franchise. The game this time around brings with it a different protagonist, a more personal story and an adventure we can’t wait to embark on. Considered as one of the most anticipated games for the PS4, the Last of US part II brings up back to a world infested by zombies. If the E3 2018 footage is anything to go by, we can expect some gruesome takedowns, a captivating story and performance to give the Oscars a run for its money. Youngblood is set in the 80’s and yes, the pesky Nazi are still dominating the world. You don the role of B.J. Blazkowicz’s twin daughters in the game. You can play the game solo or in co-op. From the developers that brought us Quantum Break is a new sci-fi action game called control. A USP of the game is the controls of time and space around you along with firearms which can be transformed into different shapes. Puns, sarcasm and a lot of jabs at the Last of Us is the best way to describe the Stanley Parable: Ultra Deluxe. This isn’t a new game by any means, but it is coming to consoles for the first time with a lot of new content. PC gamers, fret not, the content will be available for the PC version of the game as well.